When you book your London airport transfers with us, your are choosing UK's favorite airport transfer service with over 20 years of experience. Our TFL-licensed chauffeurs operate 24 hours a day, 7 days a week. Our drivers come in to the terminal 30 minutes after touchdown and we give 45-minute wait times, giving you time to clear through passport control and baggage claim without the concern of enhanced cost. Airport Transfer Service makes it easy to travel to or from London, London Airports to London and the whole of the UK including towns such as Birmingham, Oxford, Bristol, Cambridge, Nottingham, Leeds, Manchester and Exeter you do so in total class and comfort and with knowledge that everything is in hand. Many London Airport Transfers are offered by companies offering cheap rates but the reality is that costs are added drivers are late and in some cases that 'discount airport transfer' can be the journey from hell in an inadequate car perhaps with the remnants of last night's dinner still hanging in the air or the sweat of a driver who has been up too many hours. We like many have heard of people booking a minivan only to find out it is more mini than van. 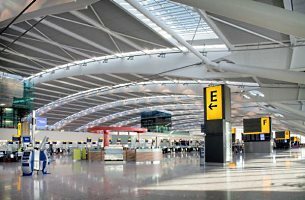 Many arriving at Heathrow and Gatwick consider taking the train but with lots of bags and the need to take a taxi or more public transport plus the struggle to reach your Hotel Home or Office this becomes and ordeal many wish they had not started. On many occasions the cost of train travel is not as cost effective or as comfortable as taking a limo service. A meet and greet ensures you travel promptly with an experienced driver and with water on board and the chance to see the sights and sounds of the UK you can see what makes us Great Britain. Schedule your London Airport Transfer with a TFL-licensed chauffeur - call us today or get a fast online quote! Always leave a suitable amount of time if you are departing don't forget a transfer in London to Heathrow, Gatwick or many of London's other airports can take time factor in for traffic and security ALWAYS LEAVE MORE TIME especially on a Friday or Before a major holiday. Need to be met earlier on an arrival just ask on our form or tell your booking agent. Biggin Hill, Birmingham, Bristol, Fair Oaks, Farnborough, Gatwick, Heathrow, Leeds, London City, Luton, Northolt, Manchester Airport, Southampton Airport, Southend Airport, Stansted Airport as well and all UK and Europe. We specialize in London airport transfers for our clients since over 20 years. Buy with confidence.